For the second post in my series, “Lessons from Europe,” I want to discuss the political gatherings in Sweden and Denmark- Almedalen and Folkemødet. 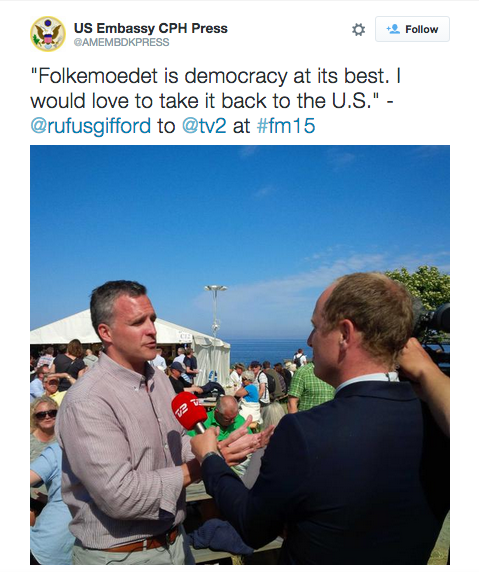 These two showcase what politics and democracy should be about, and they should be copied by states here in the U.S.
Almedalen and Folkemødet are week-long gatherings for political parties, politicians, journalists, NGOs, non-profits, citizens, and more. Almedalen has been running for over forty years and actually inspired Denmark to start Folkemødet. The Swedish gathering is eight days and is organized by the parliamentary parties. In 2014 it had over 3,500 seminars/panels in its program with topics ranging from foreign policy to healthcare to transportation policy. In addition to the daily seminars, “the leaders from each of Sweden’s 8 political parties hold speeches every night. They use it as a opportunity to focus their party’s message, put forth new policies or take potshots at their opponents.” (Radio Sweden, “What is Almedalen?“) Even the Prime Minister, Stefan Löfven, spoke at the gathering. The Folkemødet characterizes its gathering as “a meeting of people and politicians, where Bornholm provides the venue for Danish politicians to debate current political issues.” This year the gathering was held for five days and included over 2,700 seminars/panels, with “767 parties, organizations and companies participating as organizers of events.” (2015 Organizers) This year, the U.S. ambassador to Denmark, Rufus Gifford, participated in a panel on TTIP. In fact, the tweet below is how I learned about Folkemødet (and then Almedalen). The lessons for the U.S. is that we need to have gatherings like Almedalen and Folkemødet in each of the states. Here in Wisconsin, the two main political parties hold annual conventions over the course of a weekend. When you’re limiting the voices heard to those of one party, that’s not really the foundation for substantial, vigorous discussion. I attended one convention, and it was certainly energizing for members of the party, but that was about it. Given the increasing cynicism of the American electorate towards our two-party system, we should strive to hold week-long gatherings with voices from all state parties. In Wisconsin, that means including the Libertarian Party, Green Party, and the Constitution Party. Additionally, we should also hear from the hundreds of non-profits and journalists in the state. The more voices that participate and are heard, the better for our system. While it would be great to have such a gathering, I have to wonder if it is even possible in our current political climate. Polarization has increased over the years, and hateful, ignorant rhetoric makes civilized political discussions rare. Can Americans move beyond that and hold a gathering like those in Sweden or Denmark? If not, then what does that say about our future? Interesting to see if the political landscape in the US can change, would be great if you can get inspired by Almedalen and Folkemødet, but it’s difficult to scale the concept, Denmark for instance has the total population of a major US city. Id’ suggest that you start with gatherings in individual states and then see if it will scale. Good luck reinventing US Politics, the World needs it! Thanks for reading my blog and for commenting on the piece. I agree with you that a political gathering like Almedalen and Folkemødet would have to be done at the state level. In fact, I’m not sure a national gathering would even be logistically possible. Thanks again.